On Monday the full Seattle City Council voted unanimously to initiate the feasibility study for lidding the I-5 freeway. This is a historic moment for Seattle, on par with catalytic decisions like rebuilding our central waterfront, hosting the 1962 World’s Fair, and saving Pike Place Market. Years from now we will look back at Monday’s vote as the moment Seattle decided to work towards a stronger and more connected city. The Office of Planning and Community Development is poised to accept the $1.5M in funding and manage the project, which will involve an interdepartmental team of City staff and an expert consultant team. The study will focus on physical conditions, economic and finance models, and urban design and social opportunities. Lid I-5 is already working with community members to develop relevant design scenarios which we believe should inspire the consultants’ work. We expect the study to begin in early 2019. We are thankful for the work of our allies at the City of Seattle, our grassroots partners in the Community Package Coalition, and the collaboration with the Washington State Convention Center. The Convention Center’s thoughtful funding commitment continues their legacy of bridging the I-5 divide and expanding Freeway Park. We also recognize we have a long way to go, and we still need your support to keep up the momentum. While the feasibility study is underway we’ll continue educating the public and the media, building our coalition, and talking to elected officials. Crucially, we’ll also be keeping close tabs on the feasibility study in an advisory role. You can help sustain this important campaign by making a donation via GiveBIG by the end of Wednesday. Your letters to decision-makers, engagement at our public events, and sharing the good news on social media is all making a difference. Thank you for your continued support. P.S. Check out our new Twitter feed. 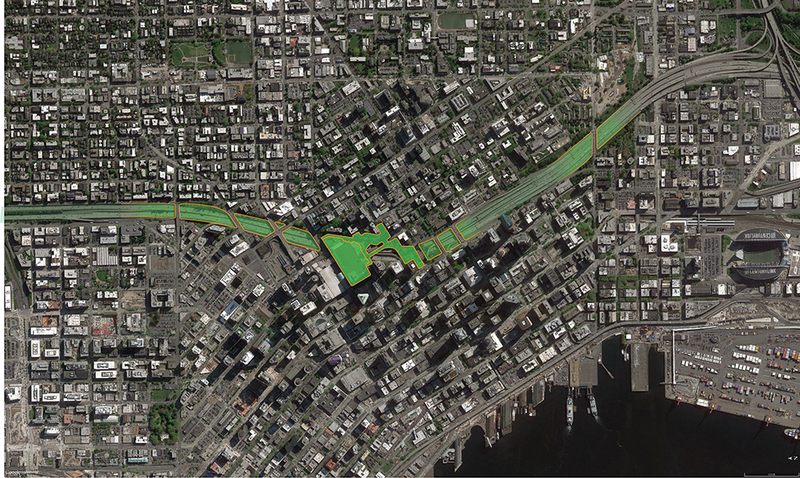 See What Lidding I-5 Might Look Like!